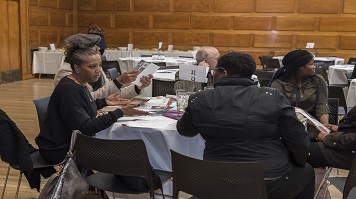 More than 100 people attended Lambeth’s first Careers Cluster conference at Lambeth Town Hall in Brixton on Thursday 29 March, at which guidance was offered to local parents to help them direct their children’s future careers. The free event was hosted by award-winning entrepreneur Bianca Miller-Cole, and covered important topics such as the impact of education reform and employment skills initiatives on young people in the borough. Guest speakers from Lambeth Council, Lambeth College, LSBU, Roots and Shoots and London School of Economics were joined by local employers, apprentices and students. The focus of the conference was on shared insight and experience to facilitate an honest conversation about the challenges faced by young people in Lambeth and to emphasise the immense number of opportunities available to them. The Lambeth Careers Cluster project is funded by the European Social Funding Agency (ESFA) and run by Lambeth Council, in partnership with Lambeth College and London South Bank University (LSBU). Sarah Gordon, Head of Outreach and Engagement at LSBU, said: “London South Bank University is privileged to be able to partner with Lambeth Council on this project. Over the last year, we have co-delivered a large number of different activities focused on supporting young people to help make their next steps in the world as confidently as possible. Read more about the Lambeth Careers Cluster.